The Robert Sorby TurnMaster is the first tool in the world to combine three cutting edge technologies in one flexible tool. Cutters are available in Tungsten Carbide, Titanium Nitride (TiN) coated high speed steel and M2 High Speed Steel (HSS) providing unsurpassed range to woodturners at every level. 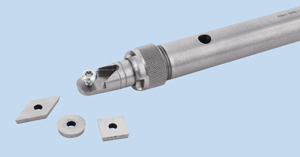 This set includes the 12" Ash Handle, 3/4" diameter Shank, Turnmaster Cutter Head, and Diamond, Round, Square M2 High Speed Steel Cutters, and Wrenches.